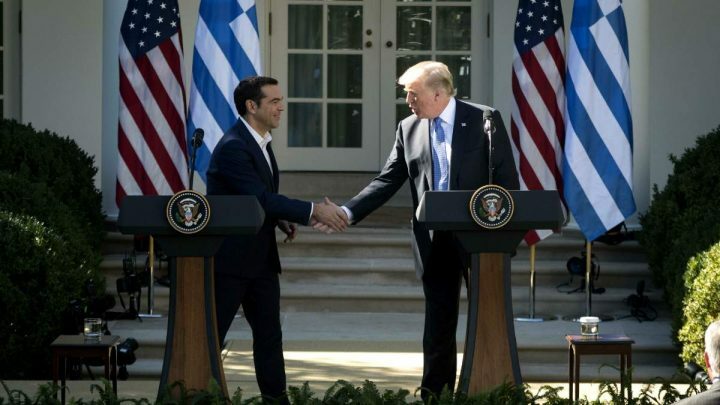 Trump to Tsipras: You're one of our best clients! Trump to Tsipras: You’re one of our best clients! “I want to thank the Prime Minister and the Greek people for serving as gracious hosts to our US naval forces at Souda bay. I also commend Greece for being one of the few NATO countries currently spending at least 2% of GDP on defence.”. This is how, the President of the USA confirmed the excellent relationship between the two countries. This is a consequence of Greece’s obligations to NATO and is a policy that isn’t affected by any kind of economic crisis. And of course this is a policy that Alexis Tsipras would have advocated against with all his power if he were in opposition. “The real cost of the F16 is €1.1 billion,” said Greek Defence Minister, Panos Kamenos. Today, Greek twitter users are circulating different ideas about how Greece – in this economic crisis – could have spent this money, putting forward other priorities like education, health and labour. Our Government though, spends money like this because they expect geopolitical stability with NATO’s intervention in the Aegean and they also provide the USA with an operational center in Souda Bay, Crete for better control of the Middle East. The government spends our money like this because they’re waiting for the IMF to play a clear role in the period after the 3rd Memorandum, which we are currently under, and finally they’re spending our money like this waiting for future investments from US companies, which of course, if it ever happens, will be with their labour conditions. We already know that we don’t have a left government in Greece now. So, we should no longer keep on being surprised every time our Prime Minister betrays himself. Maybe we’re concerned about the level of his “maturity” as time goes by and he gains experience in Office. Maybe another reason is that, searching for an alternative in the political spectrum, we can’t find anything “leftier” than this. Even though – once again – it is bad that we’re such good clients of NATO, with everything that this involves, it is also good because with political movements like this, the abyss between the 300 parliamentarians and the people is getting deeper. Just one week ago we witnessed the incapability of the opposition to honor its promise and vote in favour of a law about the legal recognition of gender identity. Today we see the government – which supposedly promotes human rights – kneeling in front of Donald Trump and being praised as good customers in the military expenditure market. The crisis of formal parliamentary democracy deepens day by day. And because there are always alternatives, it is worth remembering that democracy has other ways of expressing itself and even more direct ones. And – from what I see – society is already preparing for tomorrow.